Despite our best efforts, there are times when a tooth extraction is necessary. If a tooth is severely decayed and can’t be restored through a root canal, an extraction may be in order. 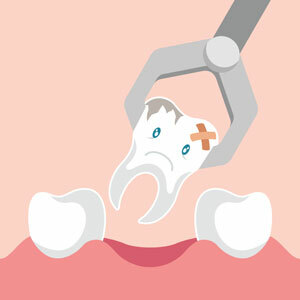 Extractions may also be in order in the case of impacted wisdom teeth. We can determine if your tooth can be saved or requires an extraction. Rest assured, that if an extraction is necessary, we provide sedation options so you will be completely comfortable during the procedure. Our dentist is highly experienced in performing root canals, so you don’t have to go elsewhere. A root canal treatment is carried out when the nerve of a tooth is affected by decay or infection. Traditionally, these teeth would have been extracted, but in the long term, that has significant impacts on our remaining teeth and will be very costly to fix. Root canal treatments prevent these problems by allowing us to keep our teeth. Frequently, our teeth may give us no indication of the presence of an infection. Therefore, it is critical to have your regular checkups so that we can identify these teeth before they start to cause any issues. There is a very commonly held belief that root canal treatments are excruciating. However, the reality is that a root canal treatment should be no more uncomfortable than any other regular dental procedure. Following root canal treatment, we recommend that a crown be placed over the top of the tooth to reinforce and strengthen it. If you are experiencing tooth pain or sensitivity, we encourage you to contact Willeri Dental in Parkwood today to book an appointment!